The June post for this series pointed out that there are two main lines of confessional Protestant theology that developed from the Reformation. 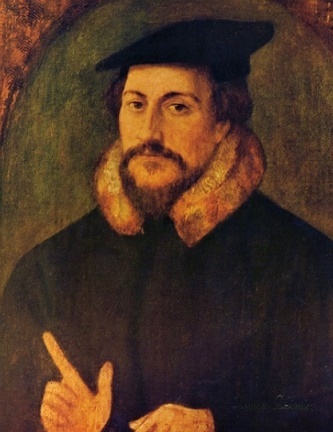 The first was Lutheran, which developed primarily from the writings of Martin Luther, and the second was Reformed, which grew to a great degree from the teaching of John Calvin. The following is the first of a two-part biography of John Calvin. Jean (John) was born on July 10, 1509, to Gérard and Jeanne Lefranc Cauvin (Calvin) in Noyon, France. Noyon is about sixty miles northeast of Paris and at the time its cathedral was the seat of the bishop of Noyon, Charles de Hangest. Gérard worked as a legal advisor to the cathedral and served in other administrative capacities. John’s mother died when he was young and his father remarried, but John and his stepmother did not get along well. Calvin obtained his early schooling privately in the home of the Lord of Montmor who was the brother of Bishop Charles de Hangest. It was Gérard’s desire that John would become a priest and his educational future was planned for that end. John Calvin was not only schooled in the home of a lord, but he was also trained in manners and proper behavior. The portrait shows dapper gentleman Jean Cauvin ready for the day with his trimmed beard, a fur collar, and a smart hat.